It was a gorgeous fall day this past Saturday in New England when, in Mansfield MA, two of my favorite things (aviation and real estate) collided. unless you think, Remax and "Big Max". For those that might not know, Big Max is the name of the Remax hot air balloon. 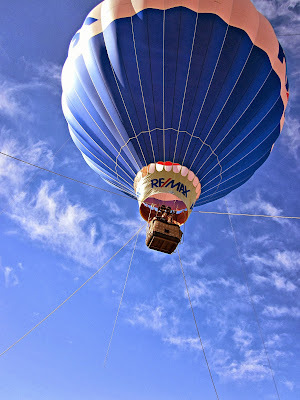 Well, at least one of the 120 hot air balloons that float through the air bearing the Remax logo. This Saturday, September 28th was no different. The venue was Mansfield MA Municipal Airport. The airport was hosting it's annual "fly in" event and the Woman of Today's "Touch a Truck" event. Who hasn't as a child marveled at the sight of a big truck, or the sound of an airplane in flight? Add to that an up close encounter with a hot air balloon, and as you could imagine the excitement on the field was electric! Folks lined up for a ride in Big Max and made generous donations to the Remax Executive Charitable Foundation and Mansfield Women of Today. Pilot, Chris Mooney was entertaining and patient as he helped folks understand what to expect and how to enter and exit the basket. After leaving the balloon, they were able to view and check out the many fixed wing airplanes that were on the field for display. Trucks of every kind were everywhere. You could hear horns sounding continually as for sure each child that entered had to sound the horn. The sounds and sight of planes taking off and landing, dogs on the grill, and the smell of popcorn filled the air. Yes. Thanks to the efforts of King Aviation, it was a great day in Mansfield. into the joys of aviation. Good morning Carol-Ann. I used to enjoy the balloon thing very much but there were only two days it was actually able to go. Hi Cal Gal - love the great PR this must generate. I can imagine it was a well-received chance to ride in a hot air balloon, and most appreciated by the Mansfield Women of Today. Cal, a hot air balloon ride is certainly on my list! I sort of want to take one over the Loire Valley in France, but sure wouldn't pass up Massachusetts! I would definitely like to see the balloon but I am not sure at this stage of life I would want to ride in it. I hope you got to take a ride and you enjoyed it. Take care..
Carol, Chris Mooney does an outstanding job, and he's from right down here in CT. We had him do some Lighter than Air promotions at a local school and he did give the kids tethered rides. I hope you folks are having a great week and all iswell with you folks. take care.. I hope all is well with you folks. have agreat wekeknd. You must be very busy selling homes. I am just stopping by to check on you folks as you ahve not posted in over a month period of time. I hope all is well and you folks have been busy making lots of money from your real estate business. I am just stopping by to check on you folks and say hello. I hope all is well. Thanks for stopping by my blog and I hope you get back into the AR scene. I hope you folks are having a good weekend. Hi Cal, haven't seen you around lately but wanted to wish you a very Merry Christmas!